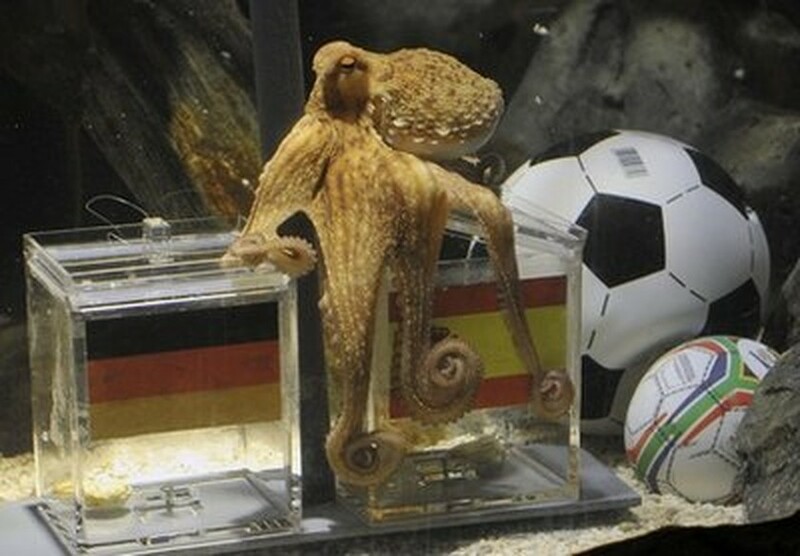 The eight-legged oracle has spoken: Paul the octopus says Spain will sink three-time champion Germany in their World Cup semifinal. The floppy football (soccer) fan from Oberhausen's Sea Life Aquarium on Tuesday chose a mussel from a glass tank marked with a Spanish flag and ignored a tank emblazoned with Germany's colors, spokesman Daniel Fey said. But there could still be hope for the Germans. The only time the usually-prescient Paul has erred in the past was ahead of the Germany-Spain final at the 2008 European Championship. Paul picked Germany; Spain prevailed 1-0. "Paul has decided that Spain will win," Fey said in a phone interview. "But — and that's a big but — Paul got it wrong only one time and that was also a game between Germany and Spain, therefore we think he just simply can't get it right when it comes to this combination." Amid intense anticipation of Wednesday's game, the eight-legged expert's pick was even carried live by two national all-news television stations. Paul, a two-year-old British born octopus with a purple-yellowish complexion and hundreds of suckers, wrapped himself around a pole between the two tanks, occasionally extending several of his eight legs toward the German glass before moving his whole body onto the Spanish side. "Once he sat on top of the Spanish glass, he opened the lid with one tentacle and grabbed the mussel with another one," Fey said. Paul's record at this World Cup has been flawless so far. In the first round of play, he correctly predicted German victories over Australia and Ghana and the country's loss to Serbia. England and Argentina then produced invertebrate performances in the next two rounds to match Paul's predictions that Germany would win. If Germany wins the semifinal despite Paul's prediction, the octopus will be allowed to predict the outcome of Sunday's final as well, Fey said. Now it's up to seafood-crazy Spain to prove him right.